My brother and I were very skeptical about Niburu and that it is visible. So we both went out last night and checked the area where you said to look. At first we saw nothing and decided to get out our telescope to take a closer look at the area. After trying to get the telescope pointed in the right place which took us quite awhile since we know very little about viewing the stars we saw a faint red object. We decided to take a photograph and the attached is what the camera caught. We were not expecting to find anything, but you were right there is something at the coordinates listed on your site. I've emailed this guy back asking for what level of zoom was used and what time it was taken at. From what I can tell so far it appears there was no cut and pasting in this image and there appears to be some interesting complexities. Slightly darker on the south side of the orb similar to what was seen on Kid A's image and the one from Germany and also with some helix type swirls above. 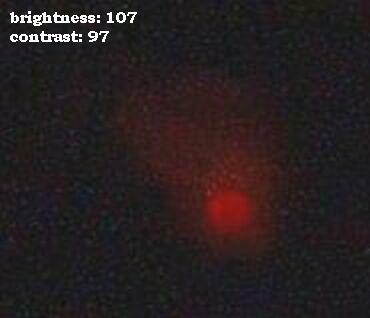 There is also a slightly lighter patch directly to the right of the object which can be seen on a larger view. Analysis indicates it may be a good fake. KidA still my best bet for possible good photo. I'm not sure what the zoom is - it is a digital camera and we had it at full zoom. I beleive the time was around 11-11:30PM we were having alot of fun and not paying attention. 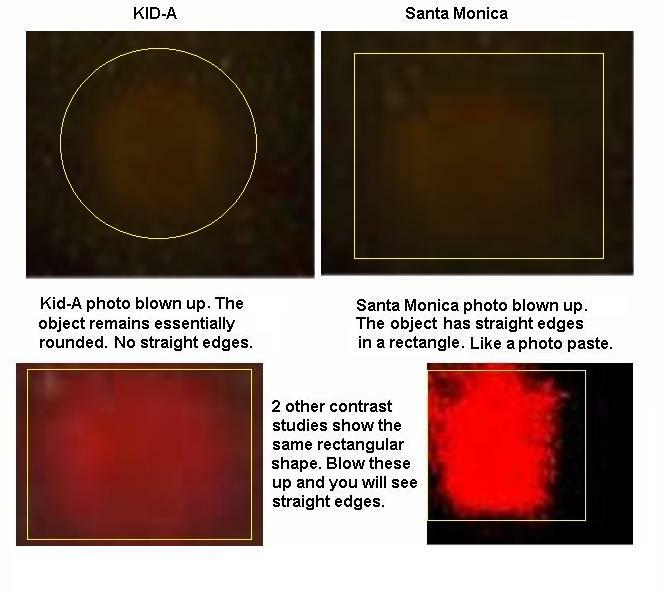 I believe this pretty much confirms the Santa Monica image as a fraud. The coordinates would have set below the horizon at about 9:30pm for that area.